The next segment of our journey called for 5 nights on Vancouver Island, BC, and then taking the ferry from Sidney to the San Juan Islands. 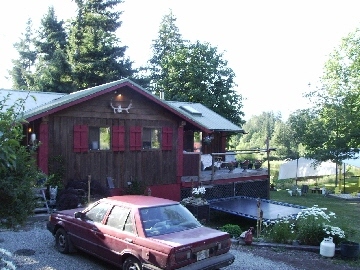 I first made reservations for the second and third night (July 13 & 14), at the Iguana Ranch, a rustic hostel between Duncan and Cowichan Lake. 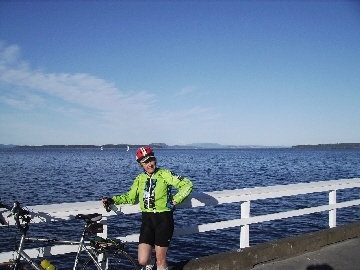 I had the following logistics problem: the Iguana Ranch reservation left two days to bike the approximately 50 miles, a good bit of it on the Transcanada Highway, from Victoria to the Ranch, and two days to get back from there to Sidney for the ferry to the San Juans. The only lodging about half way between Victoria and Iguana, that was within our price range. 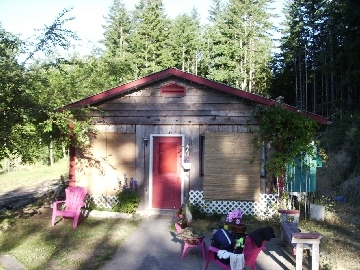 was Shirley's Cozy Rest in Mill Bay. But it turned out to be booked up for the required night, July 12. 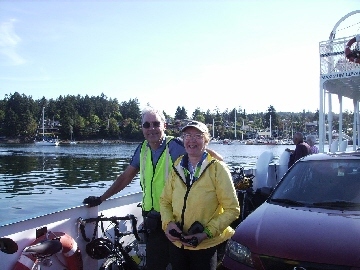 I then discovered the BC Ferry between Brentwood and Mill Bay, which allowed us to stay at the Western 66 Motel Saanichton, about 5 miles south of Sidney and still make it to the ranch the second day. As an added bonus, this kept us off the Transcanada Highway for a good bit of the ride. With 2 empty slots still left in our dance card, we arrived in Canada, our day's destination the Western 66 Motel in Saanichton. 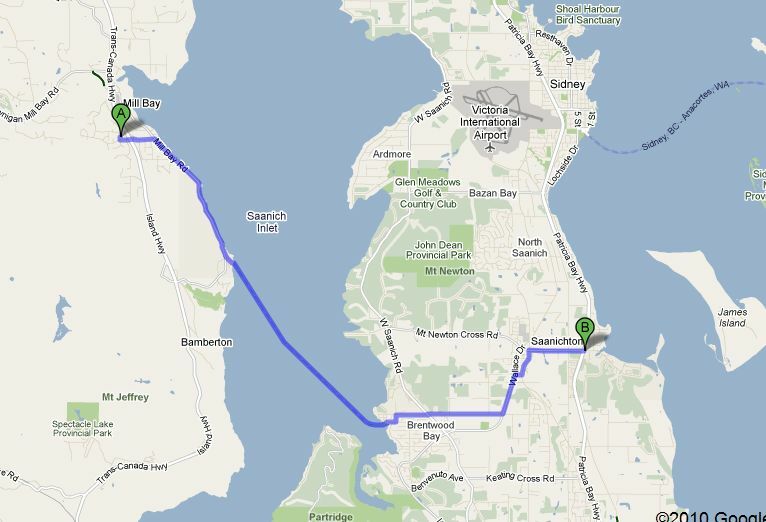 Route from Victoria's Inner Harbor: Lochside Trail, side roads when the trail got too dusty in Central Saanich Peninsula. 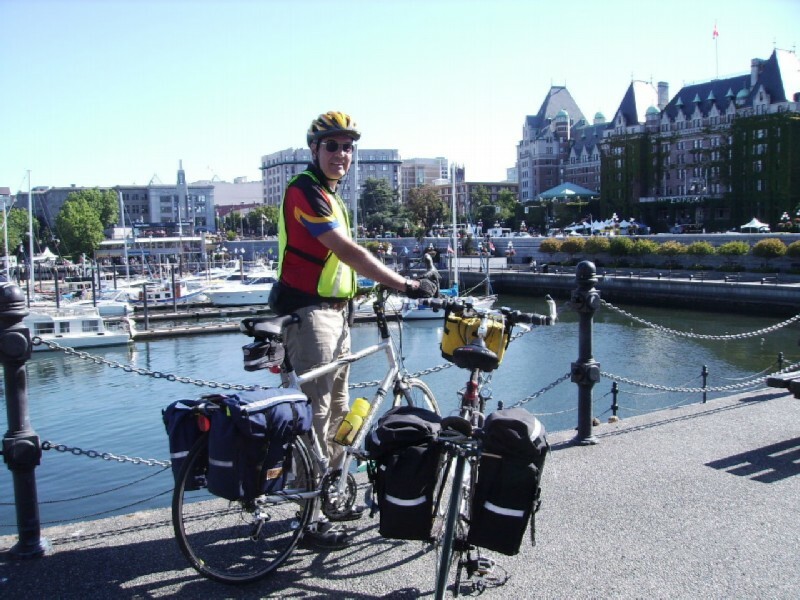 After stopping at the Tourist office in the Inner harbor for a Lochside Bike Trail map to Sidney, we proceeded up Government Street, the main downtown street. Although it was 10:00AM on a Saturday, there was so little traffic, that I thought that it was a pedestrian only zone. When I realized this wasn't so, I thought we might be in for less traffic in Canada. Not to be. Despite $6/gal gas, Canadians seemed to live in their cars just like everyone else. 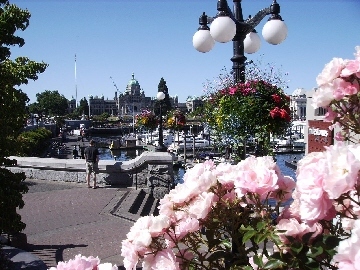 Victoria inner harbor; parliament building is in the background. Before leaving Victoria, we decided to check out the Ocean Backpacker's Hostel that had been recommended to us, because we still had two nights in our dance card that needed to be filled. The internet reviews had been positive, although it seemed like most praised the night life scene. It turned out to be academic since the price was at least as much as decent motels. 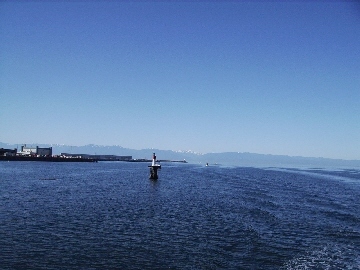 Sidney, BC harbor. 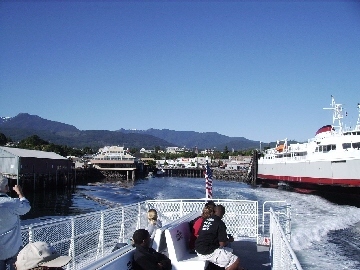 The Washington State Ferry to Anacortes departs from here. 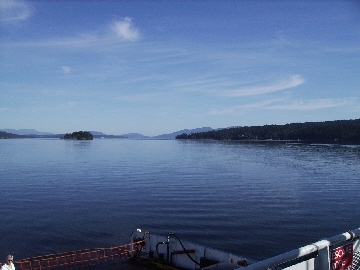 Departing Brentwood on the Brentwood - Mill Bay Ferry. This was the smallest ferry we took and the only one operated by BC Ferries. 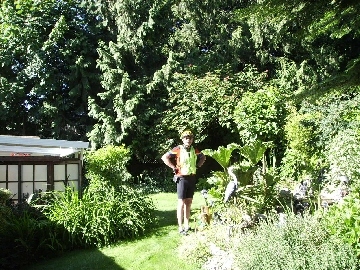 The famous Bouchard Gardens is actually near Brentwood, not Victoria. At first I thought we were looking at the ferry dock, and would have to tackle the mountain behind it (the Transcanada highway is visible about a third of the way up the mountain). Fortunately, it was some abandoned factory; and the dock was further north to the right where the terrain was much more reasonable. 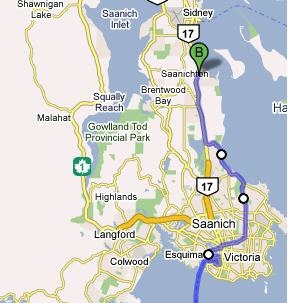 The cue sheet said we should turn right at Cowichan Bay Road; but when we came to it, there was no sign: so I kept going. When we came to a T, I knew I couldn't go wrong by going west toward the Transcanada Highway. Sure enough it soon appeared. But more importantly, there was a fake village with an interesting coffee shop at the intersection, It was one of those stops that appeared just when we needed it. Bought coffee and had lunch from grocery store in shaded, outdoor deck. 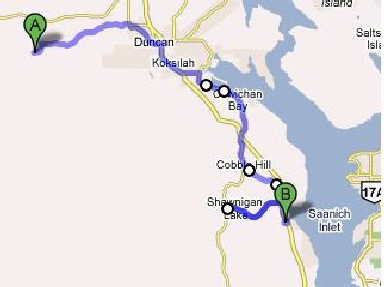 We were able to get maps at the tourist office in Duncan. They were a big help getting to Iguana Ranch and the return trip to Saanichton. Iguana Ranch - bunk house where we slept. There were about 6 bunks; but we were the only guests using the bunk house. 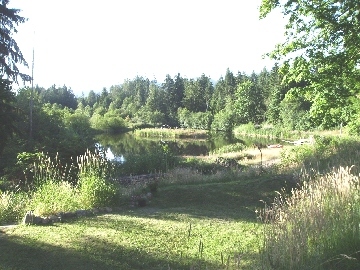 Iguana Ranch: pond viewed from the main house. A swim felt nice after the long ride, mainly uphill. I also tried out a kayak for the first time. 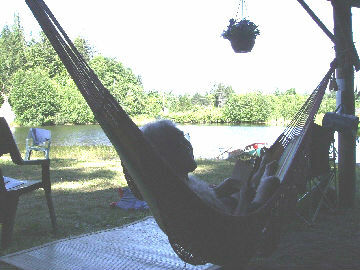 Iguana Ranch: lounging in the hammock by the pond. 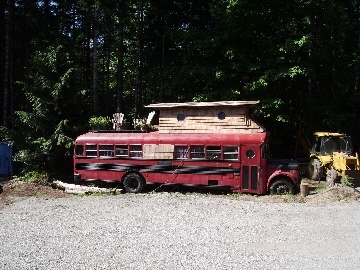 Iguana Ranch: old bus used as living quarters, complete with deck on top. A guest from Scotland, who was paying for his lodging by working, lived here. Just west of the town, there was park and beach where I went swimming and we had lunch. Rain forest along side Cowichan Lake. 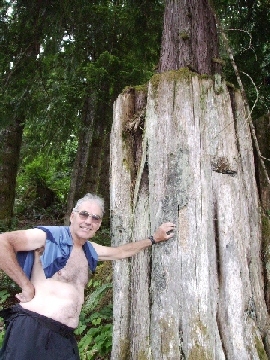 Unlike the nurse logs at the Ho Rain Forest, here trees grew out of the top of tall stumps. As we departed Iguana Ranch after a layover day, we still needed to find a place to stay on the route back to Saanichton. 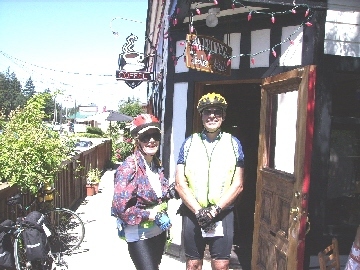 So we stopped at the tourist office in Duncan; and they were able to book a room at Shirley's Cozy Rest, the same place I had tried unsuccessfully to book for our trip north. 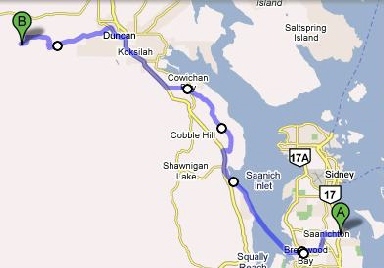 Route: back road into Duncan, short while on Transcanada Highway, Cowichan Bay Road, Cobble Hill Road. 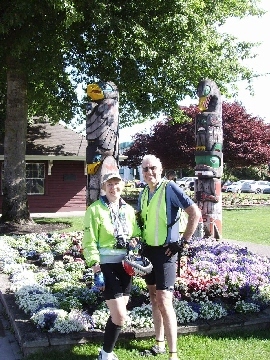 Duncan, BC touts it totem poles. Here are two alongside the railroad station. 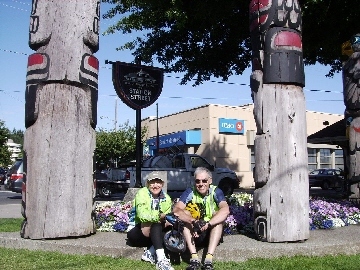 More totem poles at the Duncan station. 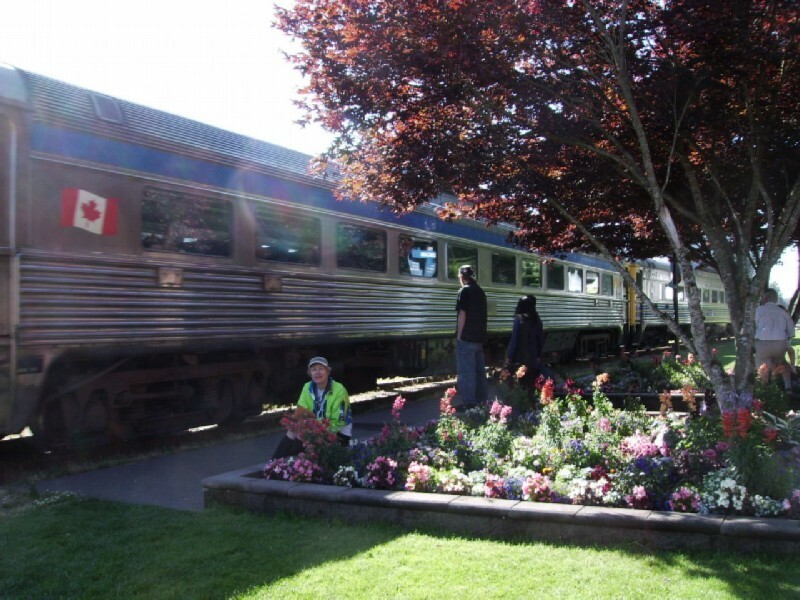 While we were at the Duncan station, the northbound Via Rail Malahat arrived. 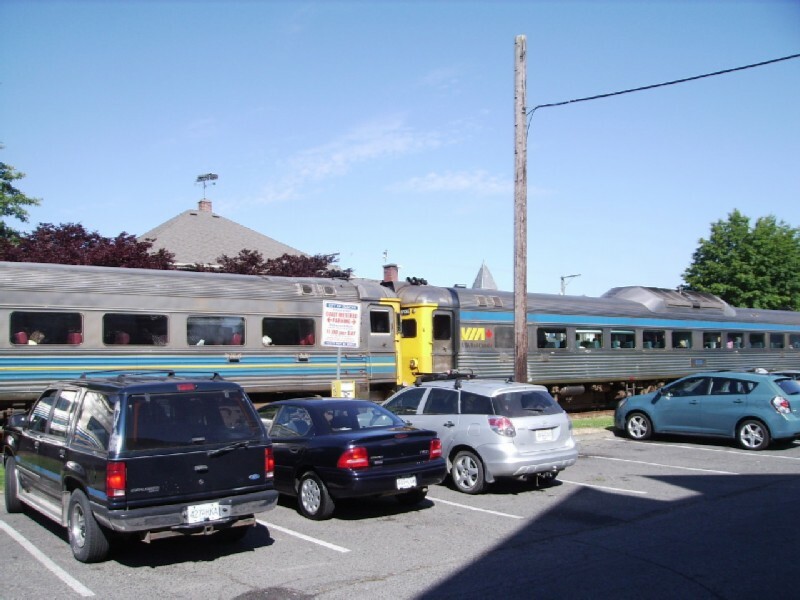 This was a 2 car self propelled RDC (Rail Diesel Car) train. I suppose they brought out the second car for the summer season. 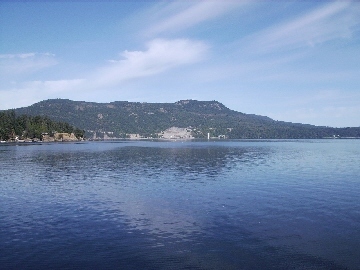 Another view of the Malahat. We were told these RDC's were introduced in the 50's. I remember them being used in suburban train service by Boston's MBTA in the late 60's. However, they had been phased out by 1980. Unfortunately, this train has since been discontinued because of the decrepit condition of the tracks. 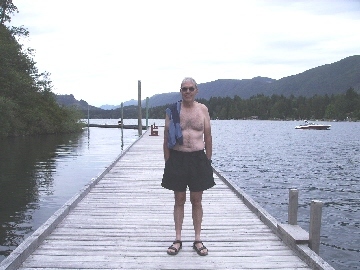 Despite constantly being in sight of water, the only places that were warm enough to swim were in the interior of Vancouver Island: Cowichan Lake, Shawnigan Lake, and the pond at Iguana Ranch. The short day back to the Western 66 Motel in Saanichton via the Brentwood - Mill Bay ferry retraced our steps of 3 days ago. 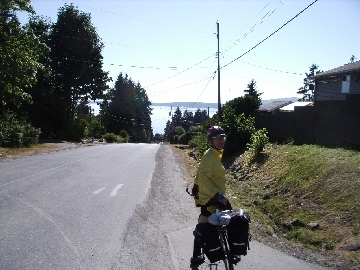 Ready to head down a steep hill to Mill Bay after leaving Shirley's. It was a lot easier to leave Shirley's than to get there.